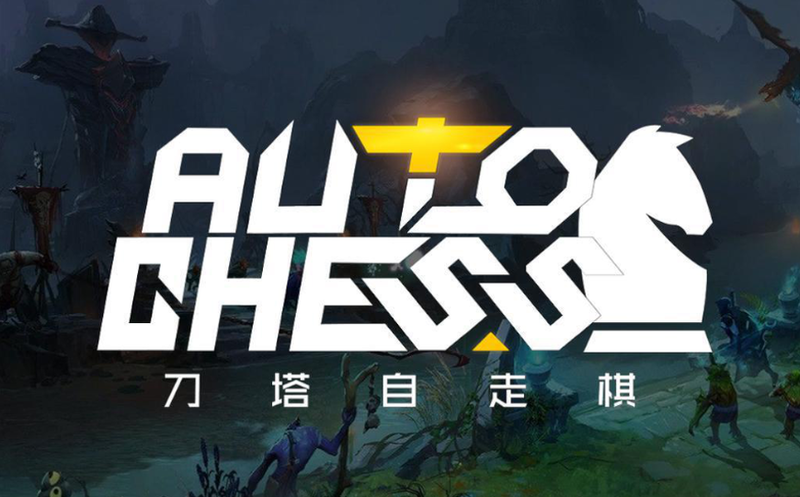 On January 4, a very interesting custom map appeared in the Steam Workshop "Auto Chess". In a couple of months, it gained just over 4 millions subscribers, and stable online with over 70 thousands of players. New mode continues to gain popularity and therefore the question arises: "How to win in this game?". And now we will try to deal with some basics, which will help you spend less time studying the game. 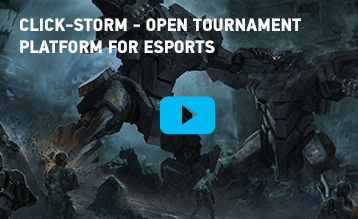 Watch how AI fight and rethink strategy. Main goal is become last man standing. 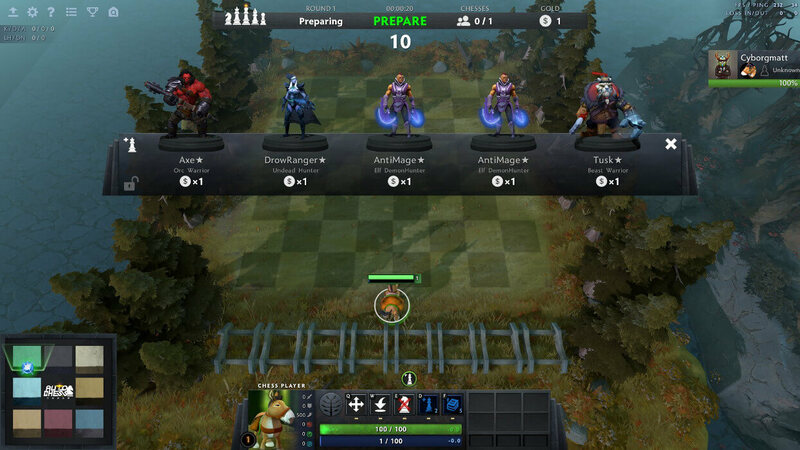 On each rounds appear waves with mobs (from which droping items) and heroes of other player. If you lose all of your heroes, you also lose health for each live enemy unit (the stronger unitm the more health you lose). 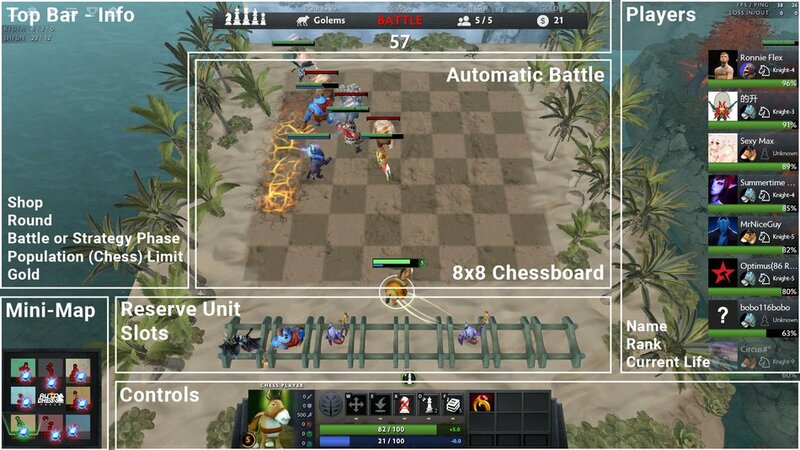 Between this battle phases, there is a 30-seconds strategy phase, during which you can buy new heroes or place them on chessboard. Generally, you have some of hero's limit. In order not to reach limit, you must to evolve your own army. Three units of the first level (1 star) turn into a unit of the second level (2 stars). Three units of level 2 are connected to a unit of level 3 (3 stars). Units with a higher level get new abilities, improved characteristics and occupy only one slot on the board. At the same time, regardless of the level, one hero spends one limit. 3 gold for each succession of winning/losing streak. The best way to get gold is to have a long succession of victories, while keeping gold in reserve. And this, of course, is not so simple. The worst scenario is to lose a lot of gold, alternating victories and defeats in each round. In this case, if we are having difficulty, making a losing streak is not such a bad idea. So we can recover the economy and win later. It is risky to do for the late game, because opponents will have more units and you will not be able to lose health just like that. But as one smart man said "You can lose the battle, but win the war." Income: At the beginning, income will be insignificant, but the more gold is already stored, the higher income from the rounds will become. Selling: Selling level 1 units occurs at full price, so you can easily buy heroes that you would like to improve later, even if you keep them in stock. You can always sell those heroes that have ceased to be of interest or have become useless when changing strategies. Player also has 8 additional slots in which units are held, in addition to those on the board, what later been filled with heroes, what needed to improve your main forces. You can also lock automatic roll of the store after waves, if necessary. Just do not forget to take off lock when you buy the right hero, otherwise the store will no longer be updated after each round. Of course, you can force roll it for 2 gold, but be careful at the early game with that. Fixed number of heroes in store: A lot of people do not understand how this option implemented, but, in theory, when any player in your game has several heroes, the chance of dropping the same hero to you will be much less. This means that it will not be bad to quickly inspect all available heroes and improve them while your opponents have not so many of them. When a player dies, his heroes return to the store. Cost: Well, there is all simple. The more expensive = the stronger hero (the rarest are only five heroes and they cost 5 gold each). But all units improve in the same way. Heroes are combined by 3 parameters: Specialty, Class and Abilities. Specialty: Putting two Orcs on the board, which give all orcs an increase in health of 250. If you set four, then the health gain will be 350. Class: Putting three Warriors on the board activates a bonus armor for the entire army of 7 units. Having six, the bonus level 2 is activated and the heroes are already receiving 8 armor. 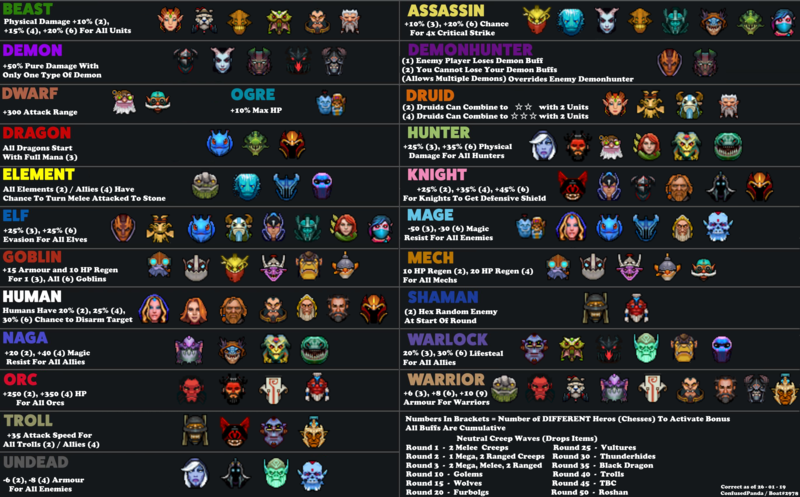 The simplest strategy is to get several heroes with the same class (mostly) and specialty. However, do not get carried away, otherwise there will be problems with certain hero stacks. For example: Warriors give an increase in physical armor. To cope with the Warriors, it is enough to expose the Mages, who inflict the main damage magic. Mages, in turn, are vulnerable to the Assasins (Assasins instantly approach the Mages across all chessboard to causing them great damage), while the Assasins themselves are vulnerable to the Warriors because they have more armor, health, etc. Therefore, when creating a strategy, you need to combine several (but not too many) different specializations and classes that will complement each other. For example, your frail Mages need three Warriors on the front line in order to gain them enough time to cast spells. And if two of them, for example, Orcs, then besides the increase in armor, they will also receive a bonus to health. As for the combination of abilities, it is a little more complicated here. As in DotA, some abilities can perfectly complement each other. Cheap and reliable, making up the forefront of your army, successfully absorbing damage from opponents. However, you should not forget that in the later stages of the game, if you do not choose a combination with other classes and specialties, difficulties may arise in achieving heroes of level 3. The most successful warriors are combined with Hunters, Mages and Assassins. Strong and expensive heroes. Playing through the Knights requires increased attention to the economy (save money at the start, earning income), thanks to which you can afford to improve heroes. Abbadon is one of the most powerful tanks (the character is able to with dignity endure all the blows and adversities of being on the front line) in mode, while Luna (elf knight) is one of the most powerful DDs (Damage Dealer, he is the main person crusher). Combine them with different heroes and get a deadly cocktail. Druids, on the contrary, are easy to improve (if other players do not go to the druids either, which is rare). Their heroes are strong even separately - Enchantress's healing can help in any builds, while Furion has a dominant advantage in the early game. Druids aim to quickly gain superiority in the early/mid game and care in economic rounds, in order to further purchase all the necessary heroes. Unlike previous examples, Goblins are perfectly combined both within the class and the specialty. Four Mechs give health regeneration to all friendly Mechs, and three Goblin increase armor and regeneration for a random ally. This makes your army much more dense from the start, which can be further enhanced thanks to items and other class abilities. 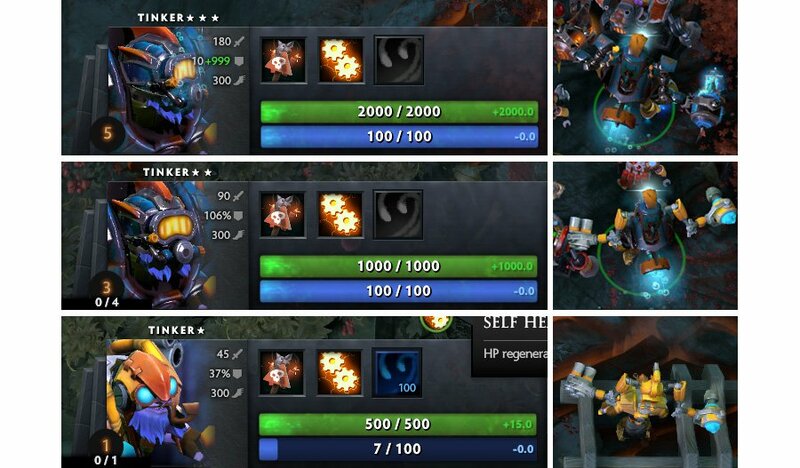 However, the Mechs themselves do not have a good DD (with the exception of the Techies, but it will only be available by the end of the game), so do not stop acquiring other pieces. The squishy heroes, causing damage should be put on the second, third rows, while the dense tanks are better to put forward. If you stick to an attacking strategy (playing through the warriors), it is better to place them closer to the enemy half of the map. If you have a more defensive strategy (for example, magicians), then placing them away from the center in one of the corners of the map would be a very good solution. In this arrangement, our tanks are at the top left, and the main DDs are at the bottom right. 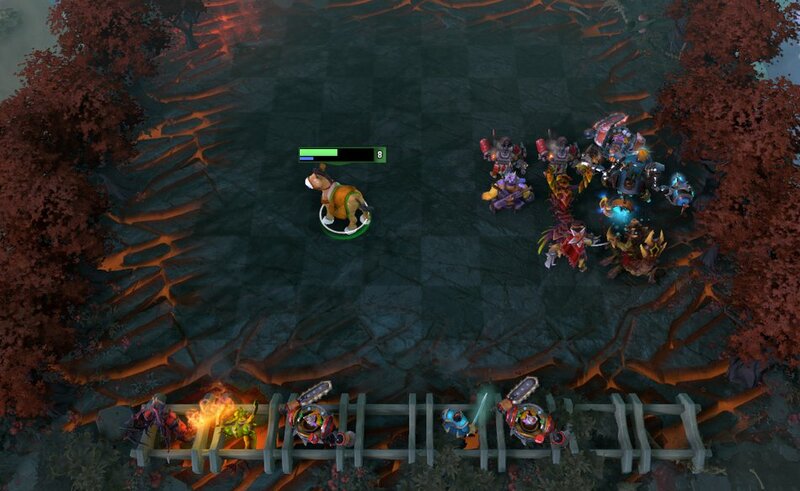 The main DD in this situation (Tinker Level 3) in the most inaccessible place for the enemy team. In the late game, when you are left with one or two opponents, it is worth paying attention to their alignment of heroes. For example, if you want to attack faster, place your units closer to the center of the map. If, on the other hand, in the enemy team there are a lot of spells, what attack on area (AoE), it is worth thinking about the dispersal of heroes (for example, to split the heroes into several small groups in different parts of the board). This will reduce the effects of such AoE spells. If TideHunter is ultimately just a couple of heroes, it will significantly reduce the opponent's cast strength and allow you to win. Items in this mode drop out exclusively from creeps, what swapn on 1, 2, 3, 5 and every 5 rounds (10, 15, 20, etc.). As in Dota, items can be combined into more powerful ones. 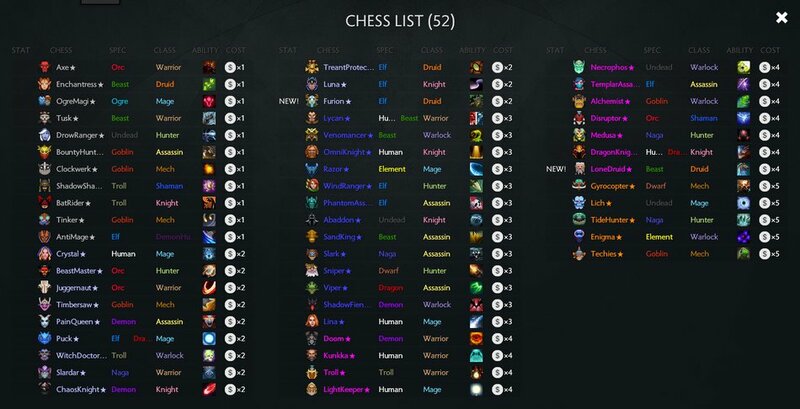 Auto Chess retains most of the Dota updates and the only difference is that you don’t need to look for a recipe to improve the items. Having correctly distributed items, you can close the weaknesses of your heroes or strengthen their main role. For example, we can give to tanks items that increase their armor and health, for our DDs - items for damage, for magicians - items that gave mana, etc. Return items is possible only if you sell the hero. If you have no one to whom things would fit, and the inventory is already clogged, then you can leave them lying on the ground. They are not going anywhere.